Robot vacuum cleaners remain a luxury for most people, yet it's safe to say that in 2019, they're common enough that people aren't stunned if you have one. The real trick is finding one that can successfully tackle your house or apartment, picking up the tough debris without getting stuck on furniture or rugs. The D7 Connected is Neato's top-of-the-line option, built to collect pet hair, cereal, and other messes lesser robots might miss. It can clean carpet, hardwood, and tile, and unlike iRobot's Roomba, two squared-off edges let it push into corners. Battery life is about 120 minutes, which should be enough to clean all but the biggest floors. Initial setup may take some time. 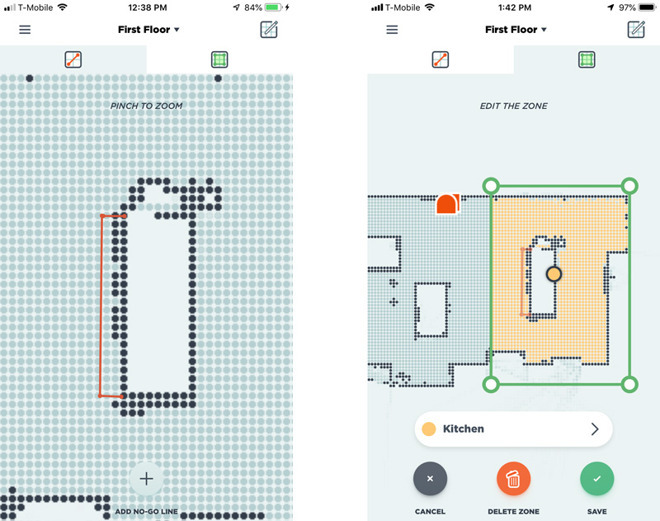 While pairing with a device should be relatively simple -- the vacuum supports 2.4- and 5-gigahertz networks, and can be controlled from both iPhones and iPads through the Neato app -- we initially had trouble with the Wi-Fi part of the equation. Multiple times the app failed to find our network, although once setup was complete, both the app and the vacuum had fairly reliable connections. We strongly suggest tidying or even rearranging your living space before you get started. 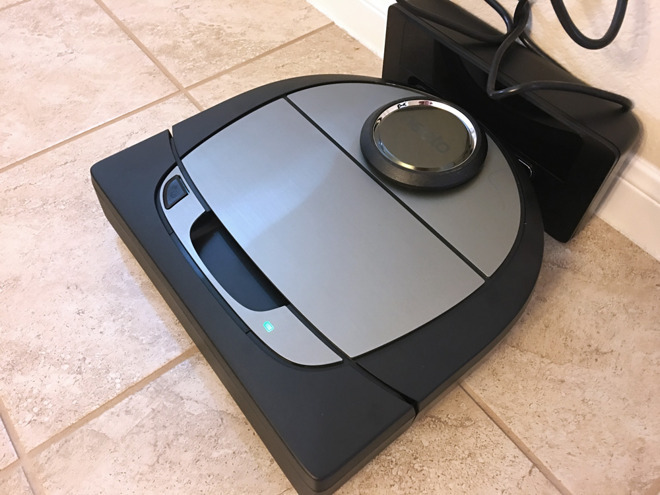 Any robot vacuum can potentially get stuck on furniture or other objects, and the D7 in particular has to complete a long, meandering recon clean to create a floor map, which has to be restarted if the robot gets stuck at any point. We wish Neato's software allowed resuming recons from the last known position. In fact this problem ended up delaying our review, since we discovered that a coffee table was tall enough to convince the D7 it could slide under, yet too low for the robot's sensor dome. We had to buy risers to finally fix the problem. Other early obstacles included barstools and a Christmas tree mat, but once those were secured, the vacuum seemed to have no trouble with terrain ranging from bare tile to thick rugs, and objects such as couches and toyboxes. One help seemed to be turning on Neato's "Gentle" mode, which makes the AI less aggressive. In fact once recon was finished, we were pretty impressed by the product's speed. On Eco mode, the vacuum cleaned the main floor of a townhouse in under 40 minutes. Turbo mode -- necessary to pick up pet hair -- can be even faster, though at the cost of noise and battery life. We didn't have a pet handy to fully test that out, but early Turbo runs managed to pick up startling amounts of human hair and other debris from a neglected living room rug and kitchen. The results were similar to an upright vacuum cleaner. One sacrifice the D7 makes is an extremely small dirt chamber. Realistically this has to be emptied every two or three runs, and while the process is easy, it's not as convenient as something like the Roomba i7+, which automatically empties into a larger dock-based container. Admittedly, the i7+ is even more expensive at over $949. On the subject of docks, another potential D7 problem is finding somewhere for the base station. To work properly it has to be placed on a hard floor and have at least 3 feet of clearance on every side, which could rule out the product for some people. 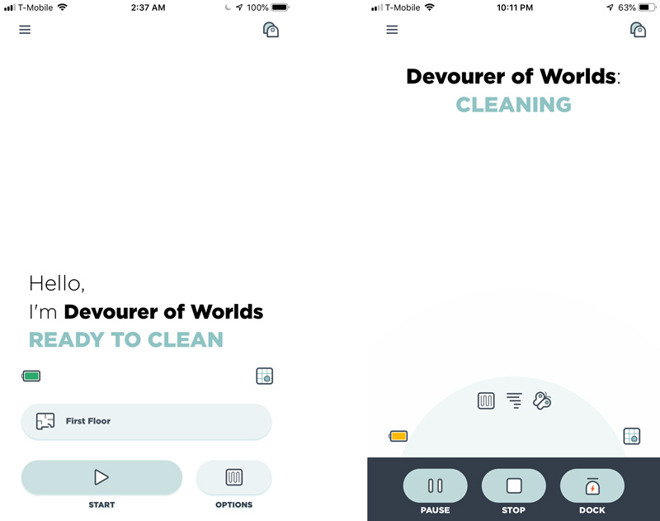 Neato's iOS app includes a variety of options for more precise cleaning. The first, No-Go Lines, lets people draw virtual barriers on a floor map to prevent the robot from going into tricky areas -- a potential solution for the likes of our coffee table debacle, assuming you're willing to move things during the recon phase and forsake some cleaning. It's a much better option than the real-world barriers Neato also offers. 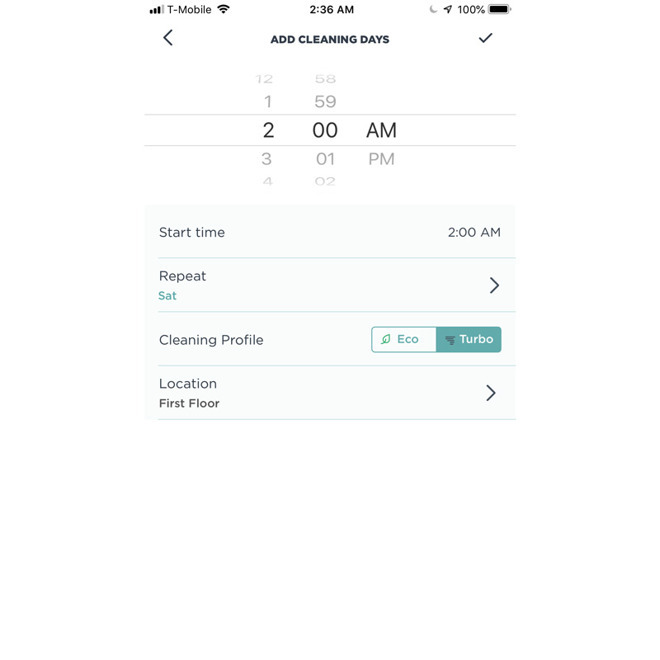 Other app controls include Spot, Zone, and even manual cleaning. Like No-Go Lines, Zones must also be user-created, and Neato's interface for this could stand some refinement. Though you can tweak and rename existing items, we found ourselves having to delete and recreate patterns if we accidentally drew something in the wrong place. If you have an Amazon Alexa- or Google Assistant-enabled speaker, you can take advantage of some basic voice commands. We do mean basic, since when we tested Alexa the only options were to start, stop, or pause. If you have No-Go Lines they won't be obeyed unless you use the mobile app. We found the best use of the D7 involved setting up a cleaning schedule. We settled on having the vacuum perform Turbo runs after 2 a.m. on Tuesdays and Saturdays, when everyone would be upstairs in bed. Apartment dwellers may want to schedule cleaning when they're at work to avoid noise. If you live in a small space there's little reason to get the D7, or perhaps even any robot vacuum. It's likely that you'll appreciate the extra cash in your wallet over avoiding 20 minutes of work every now and then. Where Neato's gadget comes into its own is with larger homes, or people who are simply too busy to do much cleaning. Once we made our test house more robot-friendly, the product proved reliable enough that we could set it and forget it, as long as we remembered to pick up anything that could get trapped. Neato could stand to make some improvements for the next generation, but as it is, they're one of iRobot's few genuine competitors. The Neato Botvac D7 Connected is currently available at Best Buy for $799.99, a discount of $30 off MSRP. "and the D7 in particular has to complete a long, meandering recon clean to create a floor map, which has to be restarted if the robot gets stuck at any point." Are you sure? I simply dislodge the D7, set it down close to where it became stuck, then press the right-side button on the top of the D7. It rotates to assess its surroundings, then picks up where it left off.